New book, 80 pages. With the introduction of the Leopard 1BE as the new main battle tank for the Belgian Army in 1968, it was a logical decision that the Bergepanzer 2 would be bought as a replacement for the ageing Sherman-based ARV’s then in service.This was an enormous improvement for the recovery and maintenance teams in the Leopard 1 tank units. After being in service for more then thirty years, eighteen Belgian Bergepanzer 2s were modernised in 2002 by the German company, FFG. Updates included new fuel cells, replacement of the main winch, and the addition of a second smaller 1.5 ton-winch at the front of the vehicle. This Model Foto Focus takes a thorough look around these little-documented but fascinating machines. For the modeller, this is the ultimate walkaround for an accurate model. 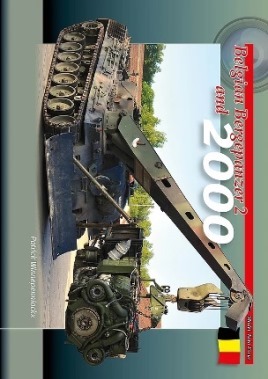 For the armour enthusiast, it describes the Belgian versions of the Bergepanzer 2 and the Bergepanzer 2000 in great detail.